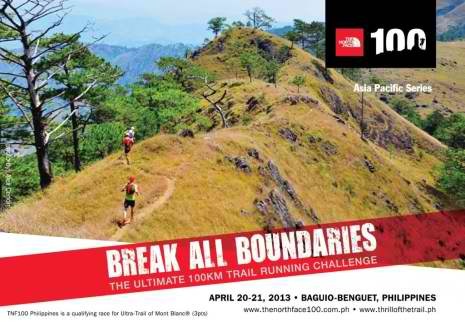 I have observed that the last year’s TNF 100 Phil (2012) results were nowhere to be found in the TNF 100 Phil website. 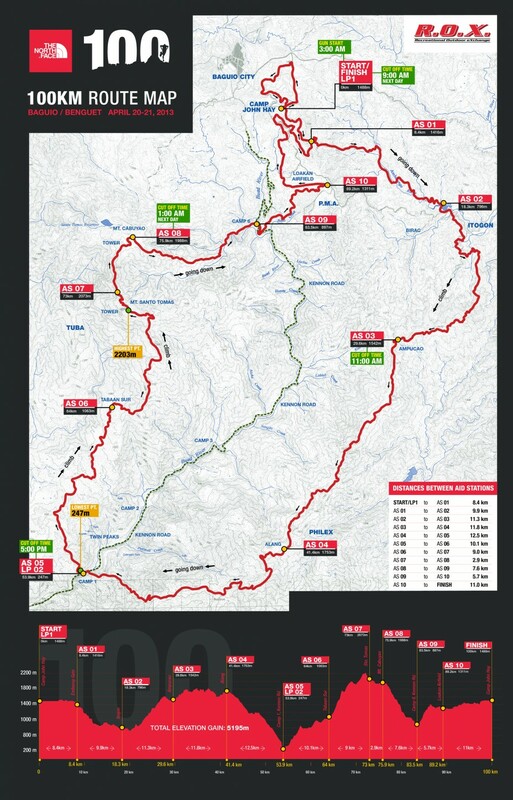 I wonder why there is no data on the past editions of the TNF 100 with regards to its results. 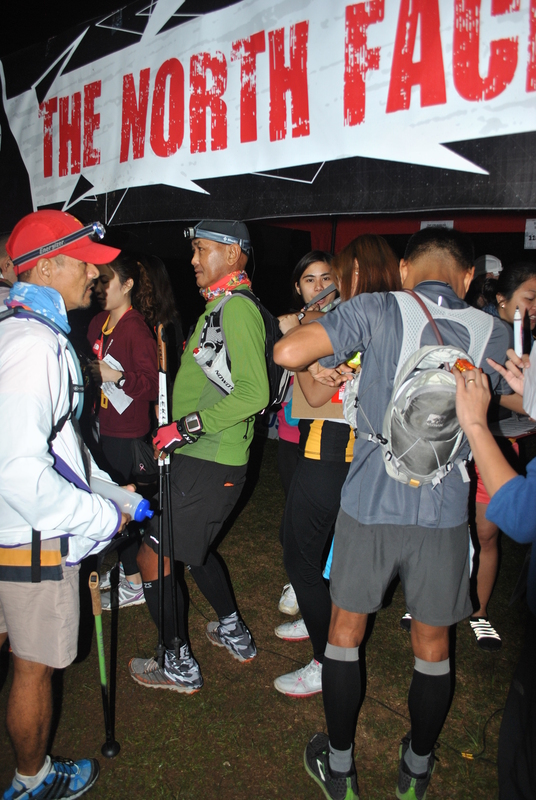 I will now post the TNF 100 Phil result in my blog as a reference for those who finished in this year’s event/edition, as well as, a reference for future participants in the said event. 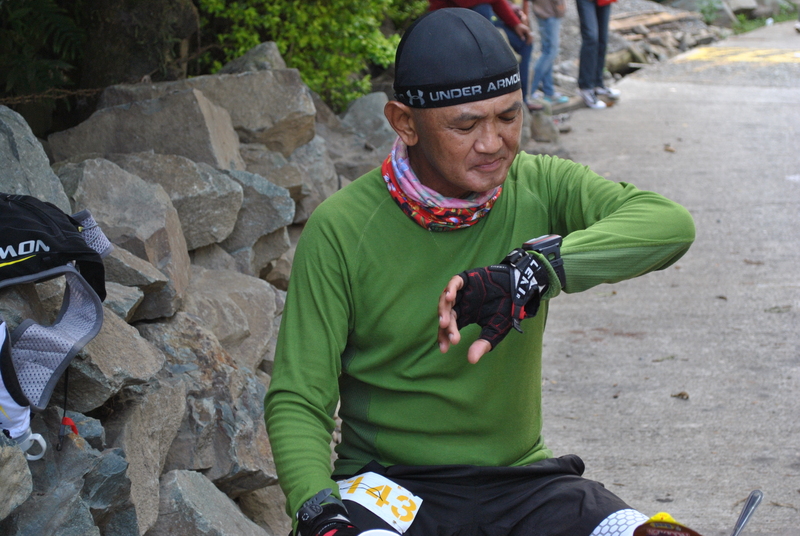 For the benefit of those readers and newbie participants in this race who do not know what is in store for them in the next 46 kilometers of the race from the AS5 @ the Bridal Veil Falls in Camp 1, Tuba, Benguet up to the Finish Line, I will continue with this Race Report and transform it as a Recon Report of such part of the course. Crossing the Hanging Bridge at the Bridal Veil Fall in Camp 1, Tuba, Benguet along Kennon Road officially starts another challenging uphill climb which is considered as the most challenging part of the course. Based from my capabilities, I considered the AS4 to AS5, 12-Kilometer downhill route, from Barangay Alang to Camp 1 as the most difficult and hardest part of the course due to the downhill nature of the route and the heat of the sun in the early afternoon. I am really weak in downhill running as I try to shorten my strides and put more braking efforts to my feet once they land on the ground for the simple reason that I don’t want to put more pressure to my aching and old knees and quad muscles. I have not yet fully strengthen my leg muscles since I was injured on my left knee two years ago. But I’ve started going to the gym for the past months but it became inconsistent after I had my tripping accidents. However, my strength lies more on power hiking on uphill climbs and could keep up with the pace of younger trail runners. But after coming down from Barangay Alang, my strength just simply dwindled down and I knew it will take some more time and power-enhancing calories to regain my strength. So let’s go back to the description of the route. After crossing the hanging bridge at the Bridal Veil Falls, it is a single track trail that is continuously uphill until it reaches a wider dirt road where you can see a house directly across such road. Turn right on the wider road until the road ends on the backyard of a house. There is a single track road on the left of the house that goes uphill that leads to a building structure which is a Chapel. On the left side of the chapel is a single-track trail that leads to another continuous uphill climb which is about 2-3 kilometers. Some of the trails are located on the edge of vegetable gardens being maintained by the locals. The single track uphill trail leads to a wider dirt road where you have to turn right. My HR usually reaches to almost 200 beats per minute before I would reach this wide dirt road. This wider dirt road is a downhill where one could easily jog until you reach a wooden gate and a house with a store. Follow this road and always take the left turn if there is a Y-road/intersection. If you turn right, most likely you will be going back to Kennon Road. Those left turn intersection will lead you to another uphill climb—the direction you have to take to reach the summit/peak of Mount Santo Tomas. There will be a concrete uphill road that will finally bring you to the Barangay Hall of Tabaan Sur, Tuba, Benguet. At this point, you have reached AS6 which has a distance of 10 kilometers from the Bridal Veil Falls. If you ask me, it would take me 3-4 hours to cover such distance with pure hiking. This is the route from the Barangay Hall of Tabaan Sur to the road that leads to the peak of Mount Santo Tomas which is few meters from the Power Antenna located at the peak of the mountain. The road leads to the 2nd Chapel and later to a Citrus Plantation. After the Citrus Plantation, it is a continuous assault on a single-track trail to the peak of Mount Santo Tomas and one has to pass the last Vegetable Garden before the uphill assault. However, there are flatter parts of the course but the trail is too narrow that every runner should be careful for any missteps. It will be dark and nighttime on this part of the course that a runner must have a very strong headlight to be able to see the different TNF markers stapled on the trees and inserted on the blades of the grasses on both sides of the trail. A runner would barely notice the old and abandoned PLDT relay station building after going through an uphill climb. From this old building and group of tower/antenna, one has to be on the road that leads to the summit of the mountain and AS7 is within reach. I am not sure if I can manage to cover this part of the course in 3-4 hours which is 9 kilometers in distance. This is the paved road from the peak of Mount Santo Tomas to the lower nearby mountain of Cabuyao which is seen from afar as downhill but on the last kilometer to the Cabuyao Aid Station, a runner will expect a slight uphill climb which is the last one in the mountain. Don’t be fooled with the distance of 2.9 kilometers as stated in the Course Map in between these two Aid Stations. Actually, the distance is 4 kilometers. So, if you still have 30 minutes remaining of your cut-off time before 1:00 AM, you have to run for your life as if somebody is chasing to kill you and give your 101% effort on this part of the course. Once you are safe at AS8, everything will be an easy and slow ride up to the finish line. This is a rocky, very steep and tricky single track downhill trail for the first 4 kilometers and most of the runners will be slower and some will stumble, slide and accidentally kneel to the loose small rocks or grasses on the sides of the trail. This where you will feel your legs to be trembling from fatigue on every step you take on those rocks, small and big ones! But for the remaining parts of the trail, it will be flatter on the side of the mountain as you pass the water impounding & pumping facility and the hanging bridges in the area. The sounds of the passing vehicles along Kennon Road will be nice music to your ears and the lights from the houses at Camp 6 would be the most satisfying sight that you would see after running/jogging and hiking in the mountains for the past 9-10 hours! You will be happy if you can reach AS9 which is your entry to Kennon Road in 3-4 hours. You will cross your last hanging bridge here after crossing some hanging bridges on this leg of the course. The distance covered on this portion of the course is almost 8 kilometers. 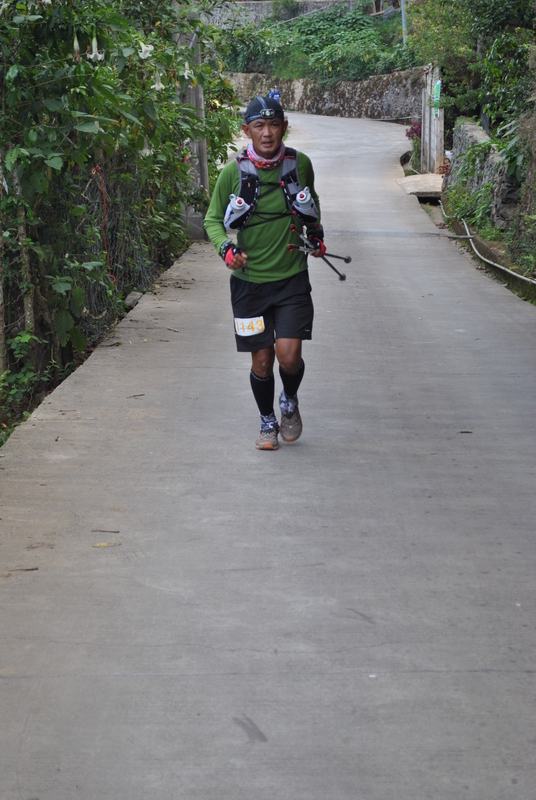 The uphill climb at Camp 6 to the northern side of PMA/Fort Del Pilar will be the last “torture” portion of the course. The runners will be running along alleys in-between rows of houses built on the side of the mountain. Finally, concrete uphill steps outside the group of houses will officially start one’s last “torture” climb on the race course. The trails to take here are the ones that leads to a higher elevation and these trails are always turning to the right! All the runners’ feeling here is to ask themselves if they can still make it to the finish line within the cut-off time or for them to simply declare DNF in the race but on the other side of their negative thoughts, runners would be happy that after this uphill climb, all the remaining parts of the route will be relatively flat. It is just a matter of mental toughness, patience and self-determination that will propel each runner to reach the Finish Line. They will be happy that it is already daybreak for the next day and the weather is cooler and the sights around are more refreshing. There are two things that I like in this place. First, when I hear the barking of dogs from the quarters of the Officers assigned in PMA and, and secondly, when I reach & stop for a drink break on a hose that has a continuous flow of cold water which is few meters away from AS10. 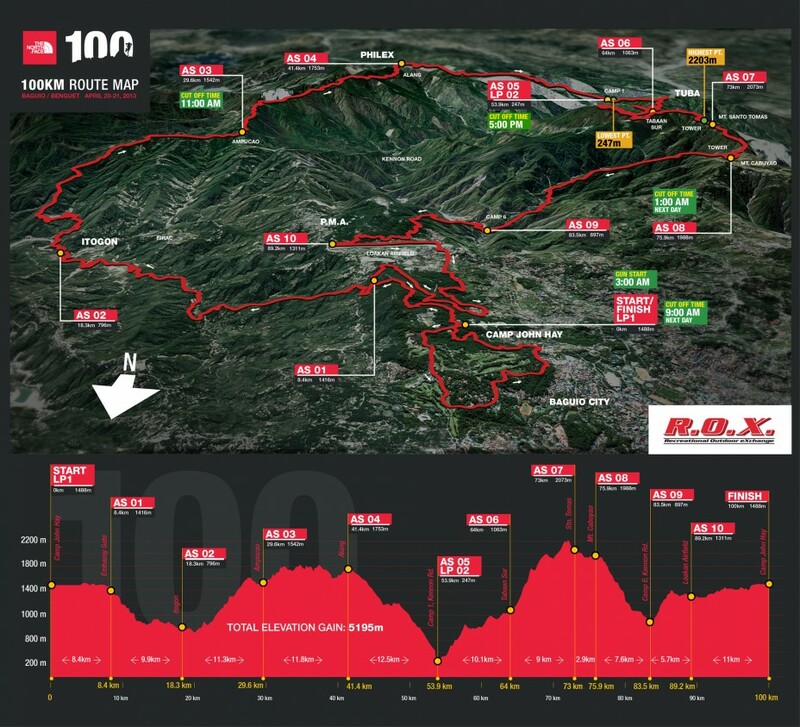 This part of the course has a distance of almost 6 kilometers with the first half as the steepest parts. I consider this as one’s “cool down” run where you can jog and walk alternately all the way on the side road of the airport/runway and into the subdivision after leaving the airport area. After some trails and painted/numbered pine trees, you are in a slightly uphill course until you reach the periphery of Barangay Scout Barrio. From there, a tour on the different trails inside Camp John Hay will be ahead of you. No matter if the distance is 5, 6, or 7 kilometers and there is no need to complain and ask from the marshals/volunteers if the Finish Line is near or how many kilometers more to go before you reach the Finish Line. What matters most is that you are going to make it within the cut-off time of 30 hours and start to imagine that Finisher’s Medal to be awarded to you once you cross the finish line. And most of all, think of a story line and description on what will be the composition of your “status” on Facebook! 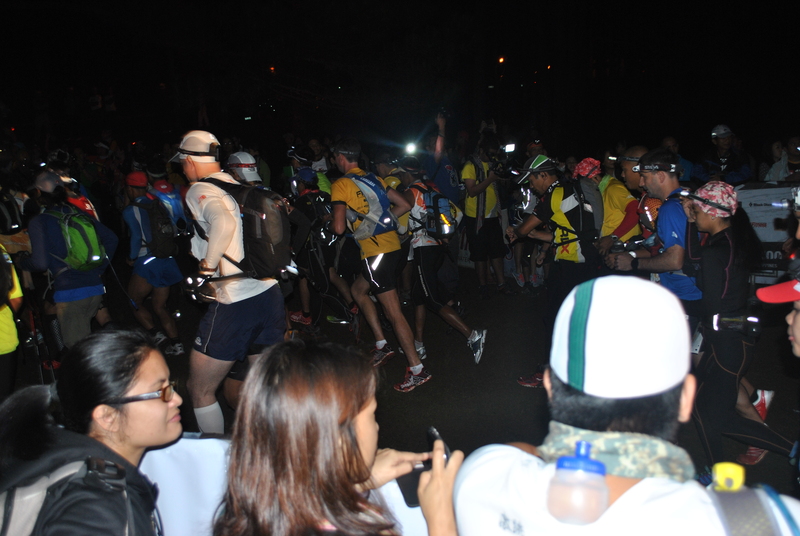 You have 11 kilometers to compose your story and “status” on Facebook along this last leg of the course. It is not enough to rely on this Recon Report if you want to really know the exact situation and terrain of the course. One has to actually recon the place and get familiarity of what to expect. Familiarity of the place will greatly contribute to one’s confidence to finish the race. However, one has to consider again other factors such as: physical & mental preparation; nutrition; hydration; apparel/equipment; and pacing. I understand that on Race Day, the trail will be properly marked with TNF Logo markers and reflectorized paints and strips and there is NO need for a detailed description of the trails. But I think this description that I made in this post will be a great help for those who will start their training in a few weeks time. You might laugh but I will be ONE of those who will start such training as soon as possible! Whether it will be the same course for next year or not, the “basics” are still the same—-uphills; downhills; “fueling” yourself; and the high altitude elevation of the course. I did not finish this race and I declared myself as Did Not Finish at Km 55. But as I promised in my past post where I mentioned my purpose in joining the race, I am here to make a Race Report and officially make a journal of what transpired before, during and after the race. 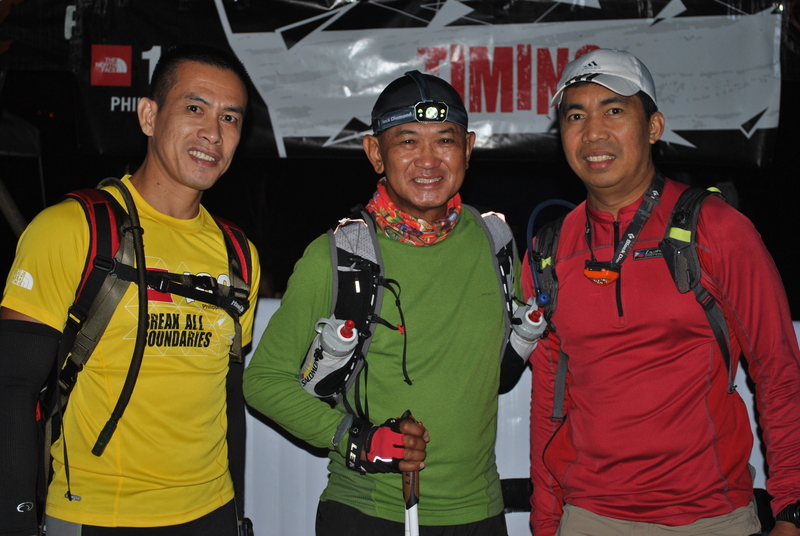 I’ve never joined a TNF100 Phil event for the past five years but I have sponsored and sent my Elite Team Bald Runner to join the yearly event. Except for last year which was the first TNF 100 in Benguet-Baguio area, my elite runners had won the Team as well as the Individual Championship Awards. Now, it is my turn to join this race as part of my preparation and training for another event. And since February of this year, I started to build-up my mileage and I enjoyed my “peak bagging” activities but these runs were less than the half-marathon distances. 2013 BDM 102: Ran the first 50K in 8:20+ hours as the 50K Cut-Off Marshal. I was logging at least 10-12 kilometers every day and I had my trail runs on weekends that would last up to 6 hours. 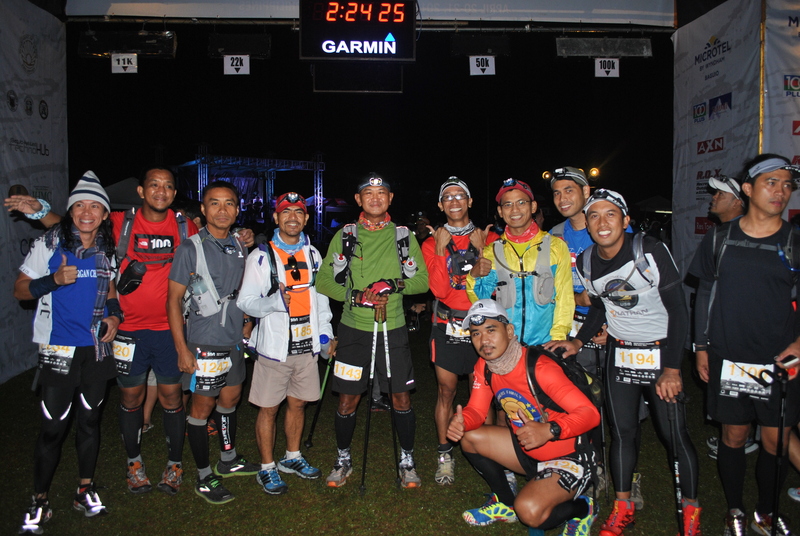 For the months of March and April (2 weeks), I went up to Baguio City for five (5) times to recon the race route with ultra running friends. These recon activities were purely hiking in nature and some picture taking on what will be expected along the race route. On these recon hikes, I was able to test my nutrition, hydration, apparel, and race strategy depending on the terrain of a certain portion of the route. 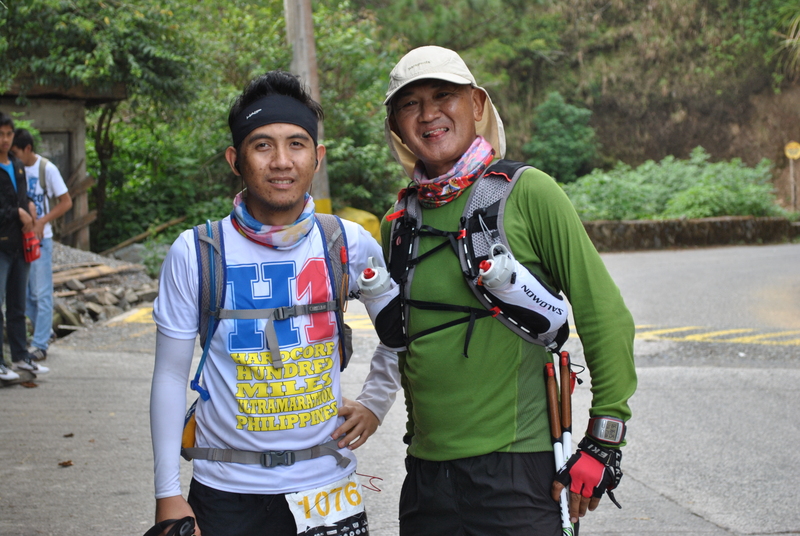 Except for the portion where past runners would call the “mossy area” and the downhill route from Barangay Alang to the Bridal Veil or Aid Station #5 (AS5), I had already a familiarity of what to expect once I will be in the race. This part or portion of the course covers an estimated distance of 20 kilometers. 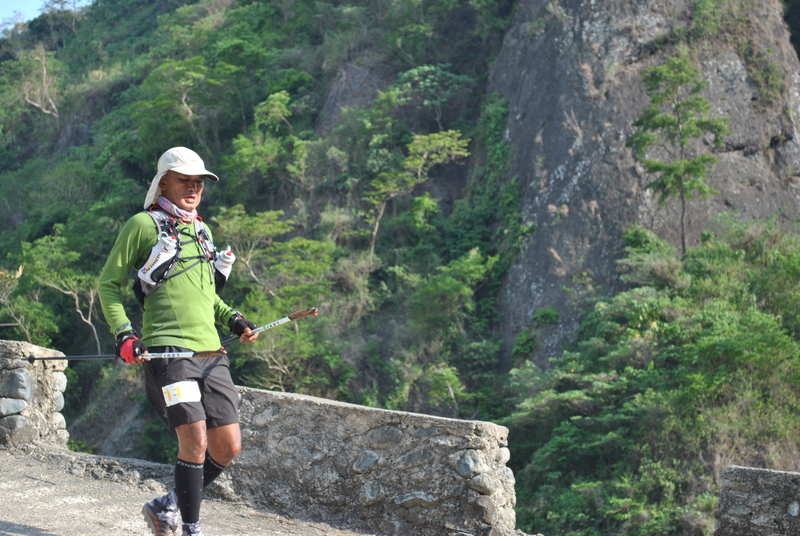 The remaining 80 kilometers were part of my recon hikes on those days and weekends that I went up to Baguio City. 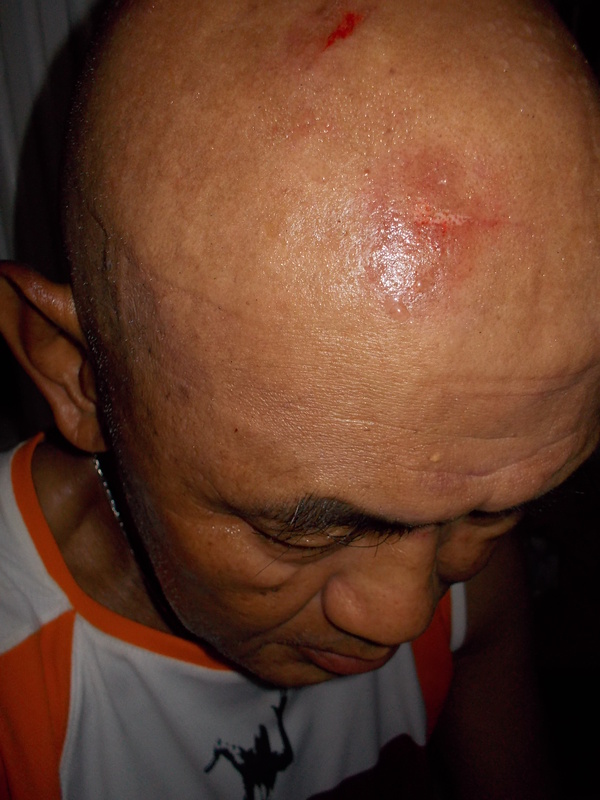 In the middle of March and two weeks before the Mt Ugo 42K Trail Marathon, I had a tripping accident which happened after running 14 kilometers of trails in the mountain of Bataan. It was already in the early evening and I was using my old headlight. I was already running on a paved road when I accidentally tripped a water hose laid across the road which was covered with a wood. I was not able to retain my balance and my right knee hit the ground first, my right arm was used to prevent my upper body from dropping to the ground but my arm collapsed and my head went crushing on the cemented road. I had 3 scrape wounds on my right knee and at least 3 scrape abrasions on the right side of my head. I was able to recover immediately from the fall and tried to stand with the help of one of my elite runners who was with me in the run. We had to take a break by dropping by one of the “sari-sari” stores at the foot of the mountain and took a Coca-Cola drink and some biscuits as food. After 10 minutes of rest, together with my elite runner, we continued our run for the last 6 kilometers until we reached our training base camp. On the following day, I could barely walked because of the infection brought by the wounds. For almost 2 weeks prior to the Mt Ugo Trail Marathon, I did not have any running workouts. However, I still managed to join the race in Kayapa, Nueva Ecija despite my lack of specific preparation for the race and the presence of pain on my right knee as a result of the tripping accident. I really could not explain. Am I really getting old or something up above is telling me to stop running or am I simply hard-headed and crazy? 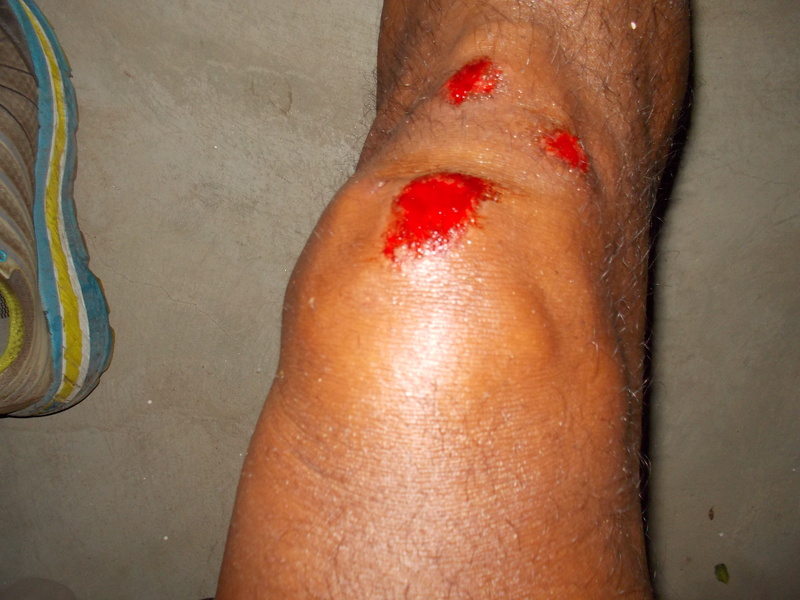 Another tripping accident happened again barely one week to go before Race Day for the 2013 TNF 100. It happened during a night run where I was testing my new Headlight and new HOKA shoes. My right foot stepped on a shallow hole and my shoes front end hit the edge of the hole and it took away my balance. The healing wounds on my first tripping accident were the ones that hit the ground but I was able to use my right hand to prevent my whole upper body to hit the pavement. Yes, there was blood again on my legs and I was limping when I reached my place. I still managed to have my last recon hike, one week before race day, despite my limp on my right leg. The last recon hike would cover the first 30K of the race on a Saturday and the last 25K on the following day, Sunday. My estimates were based from the recon hikes that I’ve conducted. Except for the portion, AS3 To AS5, I know where I could run and jog and be able to shave off some of my time of running. 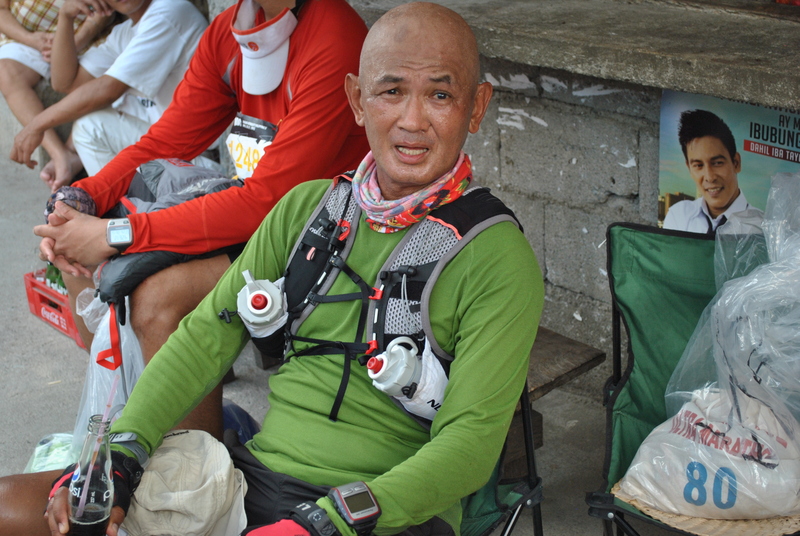 In my recon hikes, I had at least 12 hours of getting lost on the first 30K of the course and I knew that if I could run at least 5 kilometers every hour, I could reach Ampucao in 6 Hours. From Bridal Veil to Cabuyao, it took me almost 8 hours on pure hiking with rests. From Cabuyao To Camp 6, it took me 2:45 Hours during the day and I am confident to jog on the flatter trails with 3+ Hours as time to finish the portion. My recon hike from Camp 6 to the Finish Line (without those additional mileage inside the Camp John Hay Area) took me almost 4 Hours. I took the risk of not knowing about the terrain in the “mossy forest” and the road from Barangay Alang to Camp 1/Bridal Veil due to the following reasons: (1) The trail inside the “mossy forest” was not yet available during those days when I had my recon hikes. The trail was newly cleaned few days before the race. (2) No available past runner/s or “guide” for the said part of the route join me in my attempted recon hike in the said place. This part of the course proved to be my “waterloo” during the race but there are other more significant factors that simply sapped my strength during the race. The bottomline of the Race Strategy was to run/jog the flatter sections, do power walking/hiking on the uphills, and keep the knees and quads from hurting on the downhills. I had to use my trekking poles to the maximum in order to be consistent on my pace. Take a meal before the race and I did take a full breakfast meal of fried eggs, fried SPAM, and rice with coffee. Drink if you think you are sweating a lot. Drink while chewing your food. If there are sources of water along the route, drink 1/2 full of hydration bottle and then fill up your bottles before resuming the race. Drink alternately with Gatorade. Drink Gatorade by sips or in small amount. Never fill the water bottle to the rim. I bought my Helios/La Sportiva Shoes while I was in the USA last February for the sake of trying this Italian running shoe brand. 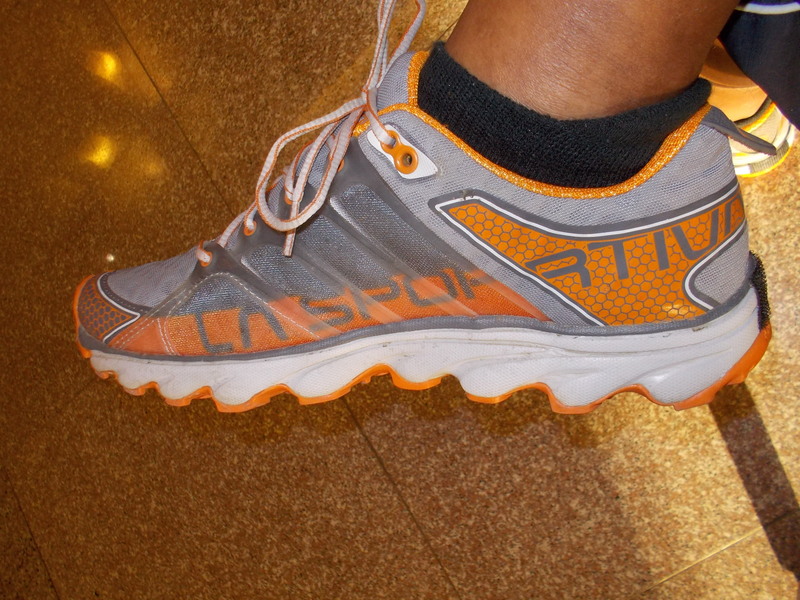 I used them in my peak bagging workouts while I was in Los Angeles and like them. I appreciated more of its capabilities when I used them in my recon hikes most especially on the Cabuyao To Camp 6 route. While the rest of group on the hike were tripping and sliding as we went downhill, I did not experience any misstep, sliding or tripping. The structure of the sole was simply amazing as they really “gripped” on the ground and the pavement. I immediately decided to choose these shoes for the race. Drymax socks were used instead of my Eddie Bauer socks. In anticipation for moderate rain during race, I used my long-sleeved Patagonia baselayer which is colored dark green. (I had a light Poncho that weighs a garbage bag tucked in one of my hydration pockets, in case of rains.) The shirt is light and could easily dry up if it becomes wet with my perspiration or by the rain. I used a Salomon EXO compression tight shorts because of its high waist line and pockets. The compression feeling on its waist portion was perfect pressure applied on my core. It also served as an absorbent for my sweat from my upper body and prevented my feet and socks to be wet during the run. On top of the compression shorts, I used my black Patagonia Trail Shorts which have 5 pockets (two at the front; two at the back; and one zippered pocket on the right upper side behind the shorts). My cellphone (IPhone4) & reading glass were on my right front pocket; trail mix food was on my left front pocket; cereal, Gatorade powder and fruit bars were evenly distributed on the pockets behind my shorts. Although I did not use my Salomon S LAB Hydration System during my recon hikes, I opted to use it because it has a whistle (mandatory equipment), string to tie my trekking poles, and lots of zippered pockets. My rain jacket was thinly folded inside the hydration compartment where the 1.5 liter bladder is supposed to be located. (I removed the 1.5 liter bladder and water hose to lessen the load and have more space for my trail food). My Nike reflectorized vest was thinly folded on the left zippered pocket while a light poncho was also folded on the right zippered pocket together with capsules of Pharmaton. Some trail foods were also stashed in the zippered back pocket of my hydration system. My lighting systems (old and new ones) from Black Diamond were stashed on the pockets of the hydration system. I used calf sleeves from Zhensa for whatever it can do to my calf muscles, protect my exposed legs to small shrubs and sharp leaves of grasses, and absorb whatever sweat coming from my legs. I used some gaiters to prevent debris and small rocks from getting inside my shoes and they perfectly functioned well for the race. I used also my favorite Buff placed on my neck to absorb my sweat coming from my head & used it to cover my nape from the heat of the sun and used an Under Armour Skull Cap on the early part of the race which fit well with the straps of my Black Diamond headlight. It also absorbed a lot of my sweat from my head. To anticipate the heat of the sun after I reached AS3, I switched to my Patagonia Legionnaires Cap. I used the latest Black Diamond’s ICON Headlamp which I bought in the USA last February and I was satisfied with its performance. It has separate battery case that can accommodate 4 AA batteries. It has a long wire and heavier in weight but the illumination was perfect for night running. It brought so much confidence in me to run in the dark through its illumination and life/power expectancy from its batteries. The separate battery pack was perfectly stowed on the main compartment of my Salomon Hydration Pack. I have another old Black Diamond headlamp in my pack just in case of any contingency. Lastly, I brought some strips of band-aids and antiseptic as my first -aid kit which was placed in the pocket where my poncho was located. End of Part 1. Race Briefing & Race Proper to follow. Pictures To Be Inserted Later.